This brand new Express by Holiday Inn Hull City Centre hotel, ideally located in Hull city centre, offers 128 luxurious en suite air-conditioned bedrooms, each with flat screen colour TV with a variety of channels, High Speed Wi-Fi Internet Connectivity, hairdryer and tea and coffee making facilities. The Express by Holiday Inn Hull City Centre hotel has an interior designed full service bar with two 42inch flat screen, a comfortable dining area which our guest can use, air conditioning and high-speed Wireless Internet access throughout the entire hotel. With the business executive in mind, exceptional air conditioned conference facilities including WIFI Internet connectivity is available. Four meeting rooms are available accommodating between 2-55 persons and benefit from natural daylight, air conditioning, Our 'Meet Smart package includes mineral water, tea and coffee, OHP & screen, flip chart and stationary. The Express by Holiday Inn Hull City Centre hotel is in walking distance of the Hull British Rail Station and the St Stephen's shopping centre and offers chargeable on-site car parking with direct access to the hotel. All bedrooms, conference rooms and public areas are non smoking. 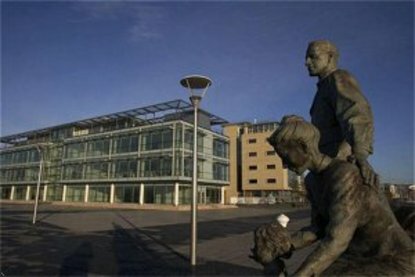 The hotel is in walking distance of the KC Stadium, home of Premiership football club Hull City.